Many of you will visit Dubrovnik on their Mediterranean cruise voyage and therefore needs to explore this beautiful city in only one day. 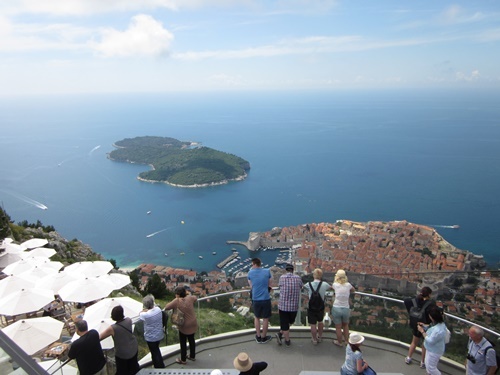 Also for many travellers Dubrovnik is only one stop on their Croatian holiday. For you here are few suggestions what not to miss and how to make your visit memorable. If you want to see as much as possible of Dubrovnik go for a walk along the City walls which takes around 2 hours leasurely walk. Entrance to the city walls is at the beginning of Stradun, and walk full circle along the city. However, if this is too much walk for you, you can get down halfway. This walk gives you opportunity to enjoy amazing views over the city roofs, narrow streets, forts and bastions. Along the way you will have a chance to sit down at one of the cafés located on the walls to have a refreshment or an ice-cream. If you want to learn some interesting facts about Dubrovnik's rich history book a guided city tour. Dubrovnik's cable car, which departs from the station above the Old Town, will take you to the top of Mount Srdj above the city. In only 3 minutes you will enjoy stunning views over the city itself and surrounding islands. While here don't miss opportunity to take amazing photos of the area. For catching one of the most beautiful sunsets in the world be there in the early evening. Panorama Restaurant is a great place to have a lunch or dinner while enjoying the views. One of the best ways to get to explore Dubrovnik in one day is just to wander through its streets. Inside the city walls there is a plenty of culture and history, churches centuries old and interesting museums. Narrow streets are filled with souvenir shops offering a range of products from Croatia (olive oils, wines, jams, liqueurs, sweet delicacies). For more local experience, visit outdoor market located on Gundulic's Square offering seasonal fruits, vegetables, cheese, olives, honey and spices. While in Dubrovnik be sure to taste delicious local food and wines in one of the numerous restaurants throughout the city. When you are enough of walking, sit down at one outdoor cafés, sip the drink and watch people passing by. To view City walls from the sea-side you should take a sea-kayaking tour. The tours depart from the small port next to Pile Gate. On this tour you will paddle along the City walls, the island of Lokrum and stop at the hidden Betina cave which can be reached only from the sea. Here you will do some snorkeling, cliff jumping and have a lunch. You will love every minute of this sea adventure. While in Dubrovnik be sure to taste delicious food which can be found in many restaurants throughout the city. Choose from a variety of dishes such as grilled fish, octopus salad, black risotto, tuna steak or delicacies such as prosciutto and cheese etc. At the end try Dubrovnik sweets - arancini - candied orange peel and rozata. You should also try great Croatian wines from Peljesac peninsula and Konavle region.